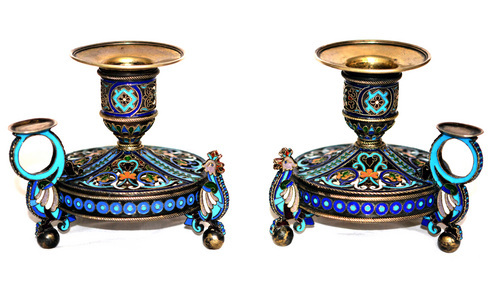 Antique Ovchinnikov Imperial Russian Silver Gilt Cloisonné Enamel Candlestick / Chamberstick Pair, Moscow 1883. 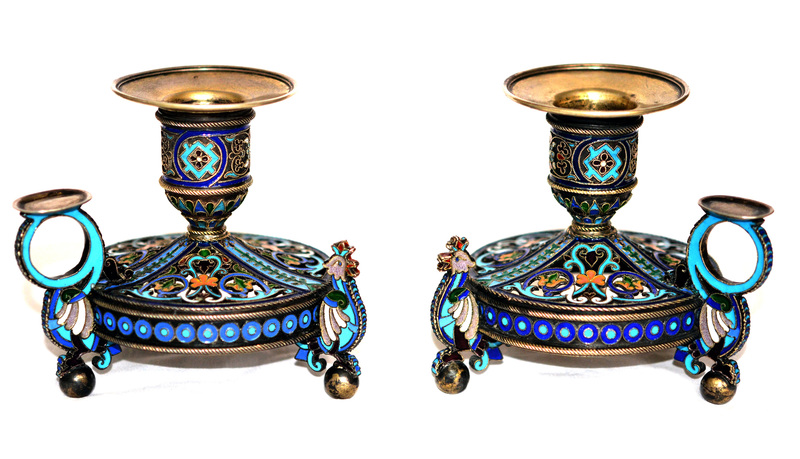 Offered for sale is an exceptional pair of antique Imperial Russian cloisonné shaded enamel candle sticks / chambersticks / candelabra in gold plated silver gilt. The height of the candlesticks is 9.7cm (3 7/8”) and both are hallmarked with Imperial Russian silver Moscow kokoshnik mark for 88 silver, as well as maker’s mark of the Ovchinnikov firm. Both objects have a fantastic Russian fairy tales design with typical rustic cockerel rooster stylized design. Each candlestick is decorated with polychrome scrolls and stylized foliage, the bases pierced, on cockerel and ball supports. The pair is in an absolutely perfect condition. The Ovchinnikov firm was probably one of the greatest rivals of Faberge along with other Imperial Russian silversmiths and workmasters. Absolutely scarce and rare antique Russian silverware and works of art collector piece and one of the scarce Imperial Russian gold plated and enamel silver objects. Provenance: Sotheby’s Nov 2012 “Works of Art, Faberge & Icons” L12116 auction sale, Lot. 487.